This is a clip from Students for Justice in Palestine's event "Don't Talk About Palestine" which was held to highlight and protest the ongoing censorship of students and faculty whose activism and or scholarship touches on the question of Palestine. 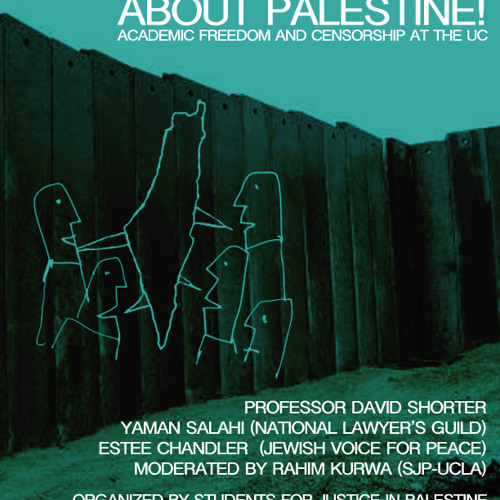 The event was held on October 18, 2012 at the UCLA Law School, and featured Rahim Kurwa of UCLA SJP, Yaman Salahi of the NLG, Estee Chandler of Jewish Voice for Peace, and Professor David Shorter of UCLA. Download David Shorter - Do you hear it? Users who like David Shorter - Do you hear it? Users who reposted David Shorter - Do you hear it? Playlists containing David Shorter - Do you hear it? More tracks like David Shorter - Do you hear it?